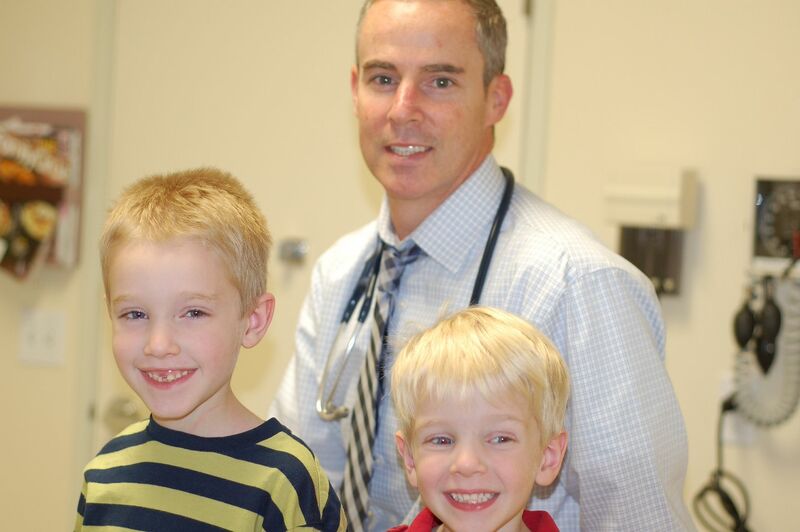 In the six years that my boys have been seen by Dr. O'Malley, he has performed circumcisions, given physicals, administered nebulizer treatments, prescribed antibiotics, ordered lab work and made referrals to specialists. But what really makes him so dear to us is that with each visit, he has shown love and compassion for our growing little family. Without hesitation, I can say that we have never felt anything but love and care from Dr. O'Malley - even when we may have been, at times, problem patients. As a general rule, I'm not much a fan of doctors. In fact, I can't recall ever having a doctor of my own that I even liked on a personal level - much less one that I deemed "pie worthy." But because I know how much our pediatrician loves my boys (and in all fairness - most likely all of his patients), I have complete trust in him and his professional advice, in addition to the utmost respect for him as a person. Time after time, I have found myself sitting in the examining room, faced with a difficult decision, asking, "What would you do if it was your child?" (And with one of my children in particular, there seem to be more choices than I have ever cared to make.) Even my husband Will, who rarely misses a pediatrician appointment - possibly because of how much he likes Dr. O'Malley, but in all likelihood because he is just such an awesome Daddy - has even voiced that we have two mentors when it comes to parenting: God and Dr. O'Malley. On a personal level, there are very few people that have seen me as vulnerable as Dr. O'Malley has. Early on in this parenting thing, he reassured Will and I that - despite multiple and successive trips to the ER - our oldest was not in fact going to die from asthma. He comforted me when exclusively breastfeeding my youngest just wasn't in the cards anymore. And he listened patiently through my tears to my increasing frustration over one of my children's (who shall remain nameless) defiant and disruptive behavior. All without making me feel foolish or judged - and for that, I am especially grateful. 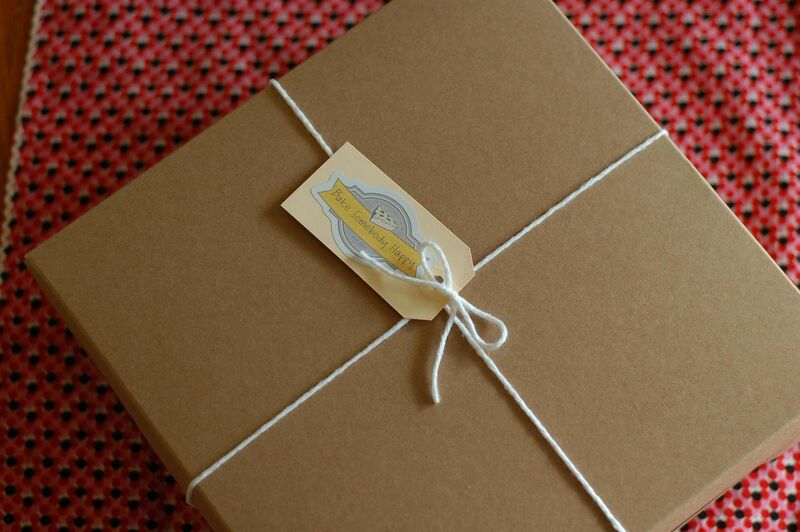 So, with an upcoming well-child appointment quickly approaching, I knew it was time to make a pie for Dr. O'Malley. And given our history, an "allergen pie" just seemed to make the most sense. You see, over the years, my oldest son has had allergic reactions to a whole slew of foods. Although most have since resolved, Wilson's diet has at various times been cow's milk, egg and/or nut free. As an infant, there was the blood test that showed positive reactions to cow's milk, egg whites and peanuts. Months later, there was the reaction to the flu shot at the injection site (most likely caused by egg whites). 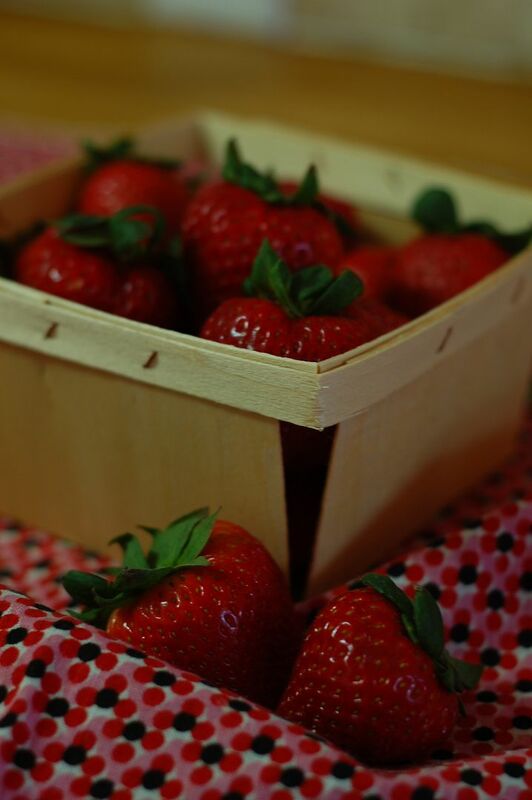 Not to be outdone by hives and dramatically swollen facial features in response to cinnamon and again (only this time with the addition of labored breathing - yeah, that was scary) in response to strawberries. So, what do you get when you mix strawberries, cinnamon and milk? 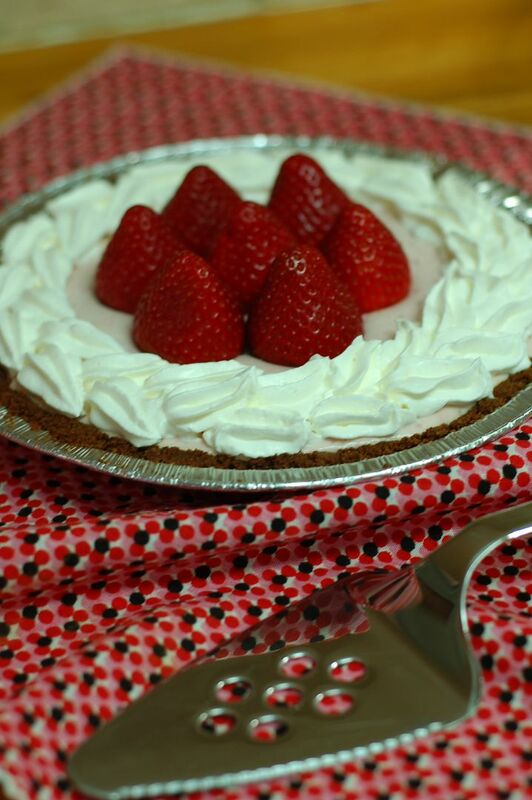 Why, Dr. O'Malley's Strawberries and Cream Allergen Pie, of course! 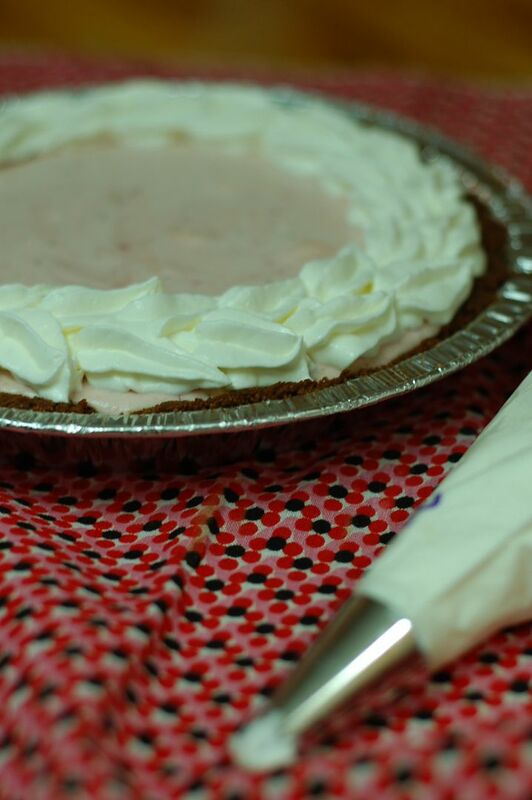 The obvious choice was to begin with a strawberry pie base and add as many of our known allergy triggers as possible - all the while attempting to keep it tasty, of course. 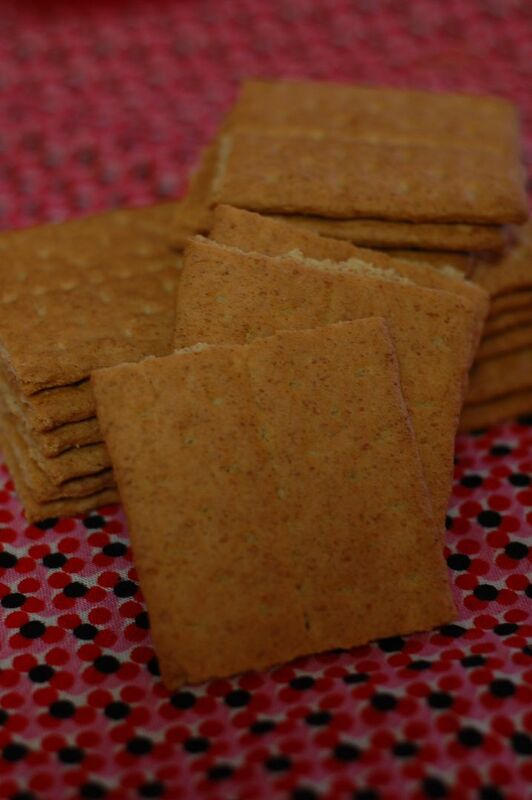 We began with a graham cracker crust - partially because graham crackers seemed like a natural for a pediatrician - and partially because it would be the perfect vehicle to sneak in the first allergen - cinnamon. 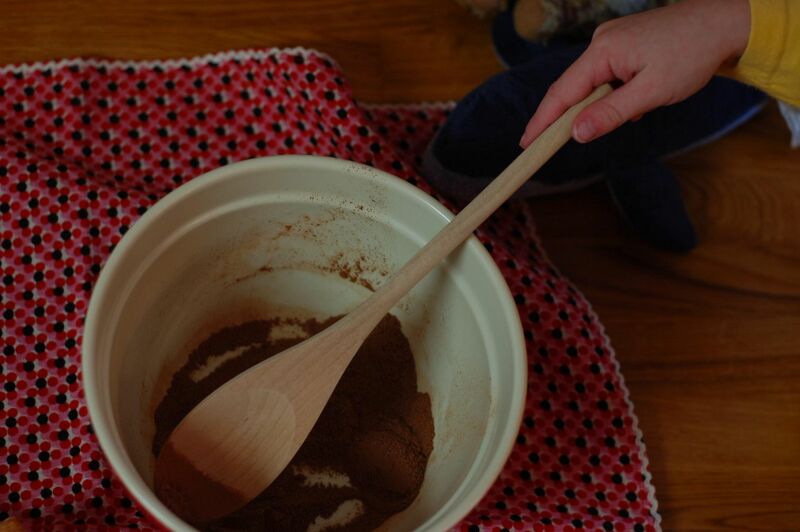 My little sous chef's began by crushing a whole sleeve of honey graham crackers in the blender, negotiating feverishly for whose turn it was to push the button first. 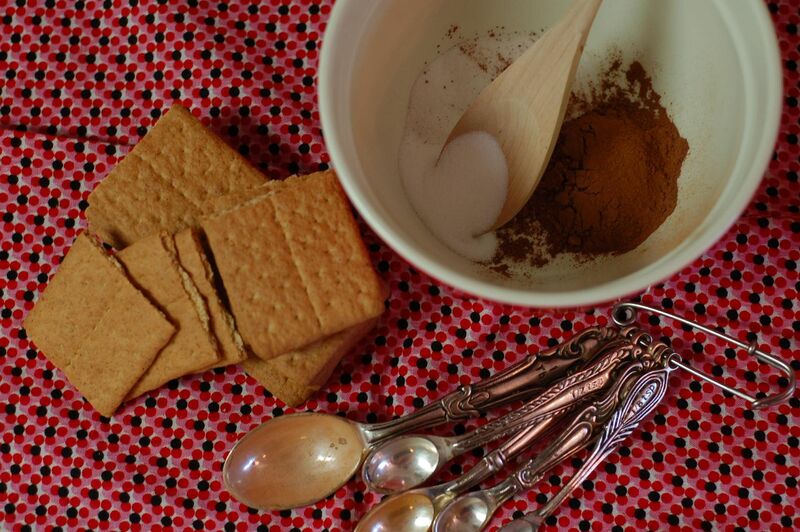 Once we had ourselves a thoroughly ground bowlful of crumbs, we added a dash of cinnamon, a spoonful of cocoa powder and a bit of granulated sugar before stirring in the melted butter. When the mixture held together in a moist crumble, we emptied the bowl into a pie dish, using a juice glass to press the crust firmly into the bottom and up the sides of the tin. 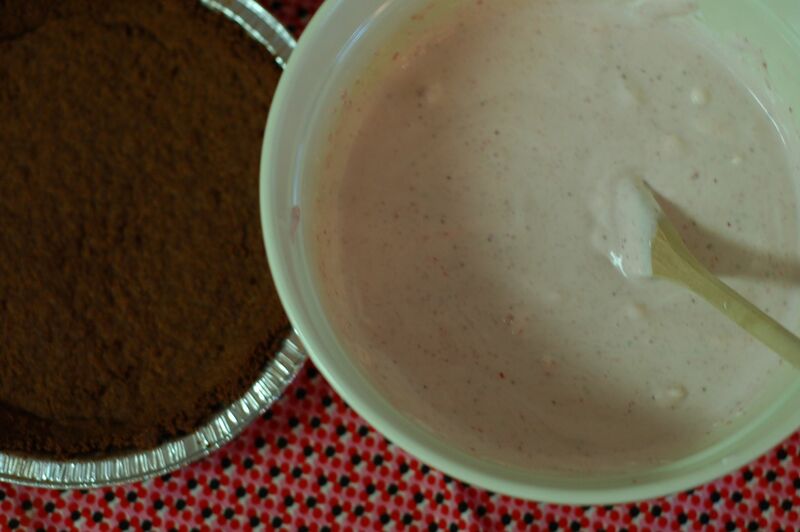 While our crust baked and then sat on the counter to cool, the boys and I prepared the pie filling - a riff on strawberries and cream in our attempt to incorporate two more allergens: strawberries and cow's milk. 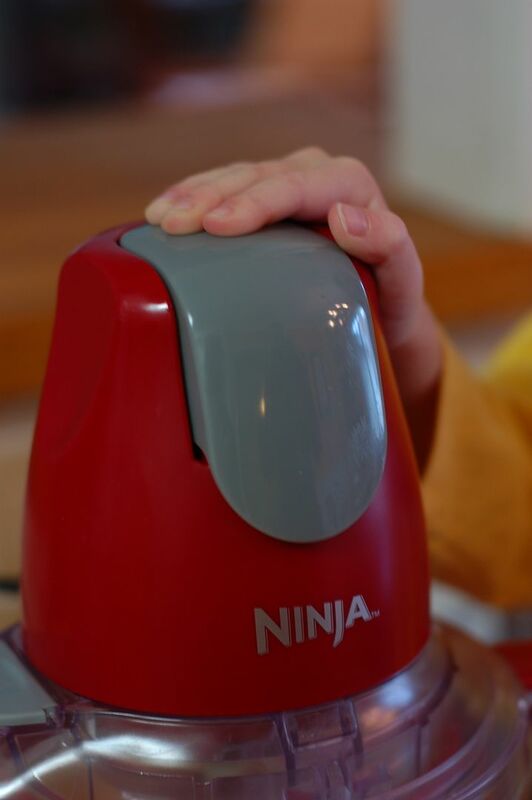 My little guys eagerly returned to their favorite Mommy-approved appliance - the blender - to process a pint of ripe, hulled strawberries until finely pureed. 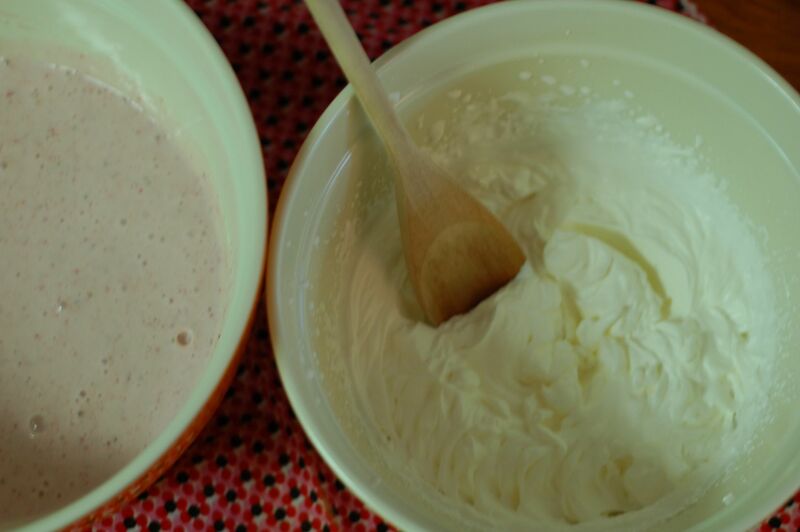 Then the boys took turns using the handheld mixer (with a fair amount of supervision) to blend sweetened condensed milk - our fancier version of "cow's milk" - with a carton of softened cream cheese, a splash of vanilla extract and the strawberry puree. I just love to watch their confidence and independence in using kitchen appliances grow - a precursor to the allure of power tools, I suppose. Meanwhile, in a separate bowl, we beat heavy whipping cream into soft peaks and gently folded it into the strawberry filling. 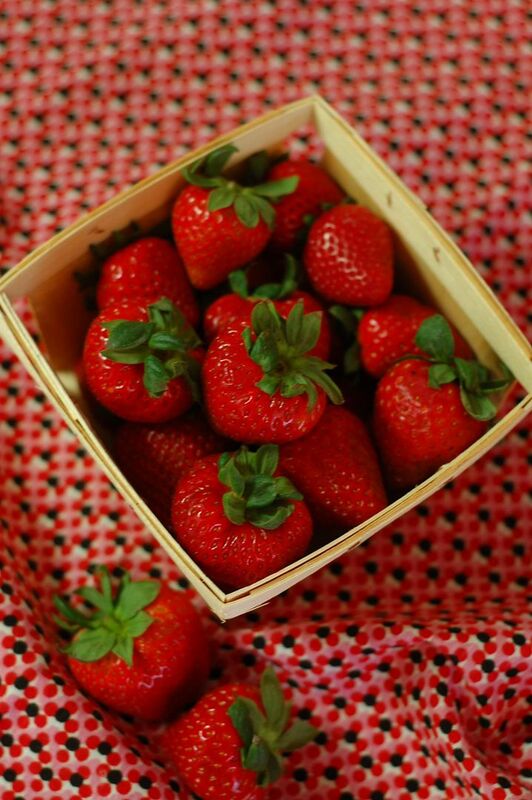 Of course, there was the usual begging for a "taste" - thank goodness we aren't allergic to strawberries anymore! 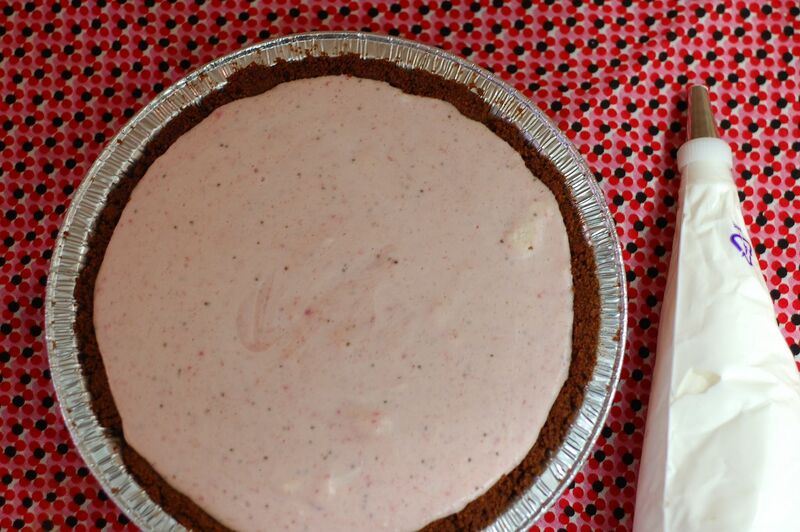 We spooned the light and airy strawberry and cream filling into the cooled, pre-baked graham cracker shell and placed the whole pie into the fridge to chill before decorating. 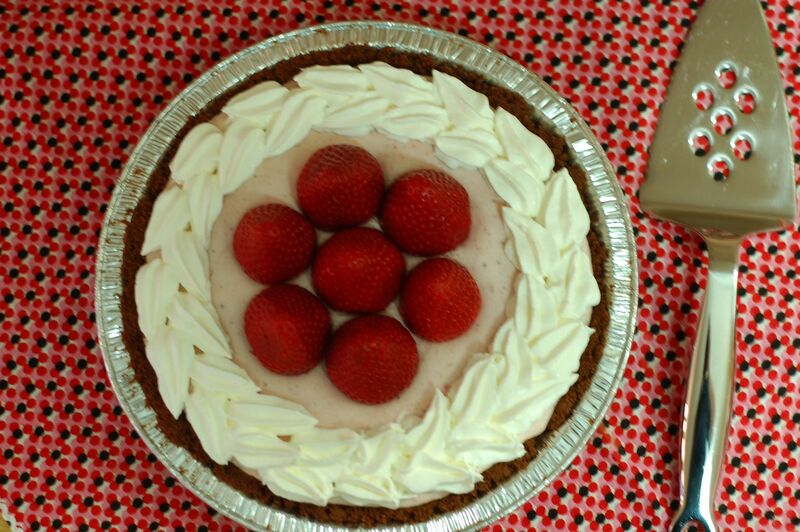 Once cooled, we beat the remaining whipping cream with a bit of powdered sugar to pipe onto the top in a decorative pattern (okay, this was mainly Mommy's job) before topping off the pie with several whole strawberries. With the exception of egg whites and peanuts, which I think just might have been a tad bit overboard (although, I did toy with the idea of peanut butter and strawberry jelly...or even strawberry meringue) I think we came up with a little something that symbolizes our appreciation for Dr. O'Malley, while still being edible (fingers crossed). When you bring these perfect, new, little people home from the hospital - babies that you have hoped for and prayed for and waited for - and then are charged with the task of keeping them alive without really the slightest inclination how actually to do that, a pediatrician that you trust is priceless. Dr. O'Malley has monitored, examined, healed and loved on my children on numerous occasions. But he has also given Will and I the reassurance, support and confidence to continue on in the sometimes daunting and uncertain task of parenting. And I certainly think that deserves a pie. Beautifully said and we share your sentiments! Blessed by such an amazing doctor!